It goes without saying that discus fish are the incontrovertible kings of the freshwater aquarium. This eponym can be attributed to their regal, slow movements, beauty and appearance, as well as their history. Discus Fish Origins are traced back an imperial marriage. Discus fish origins can be traced back to the early 1800s. It came about after a royal entourage who were naturalists sent by the Emperor of Austria, Franz I, to propose to Leopoldine, the daughter of State Chancellor and Foreign Minister Clemens Wenzeslas-Lothar von Metternich-Winneburg (1773 to 1859). They were accompanied by a team of scientists, painters, researchers and academics. They ended up exploring the nature in Brazil. Later on, most of the entourage went back to Austria but one Natterer remained to explore more. He was later faced with a lot of challenges as he lost his companion and he himself almost died apart from losing many important documents, animals and plants. He however survived and later managed to reach Barcelos on the Amazon. Between the years 1831-1834, a discus fish was by chance caught in one of his nets. He returned to Austria and arrived on August 13, 1835. His collection trip hadlasted 18 years. During this time, he acquired 1,671 species of fishes, 1,146 mammals, 1,024 types of mussels and many others. In all, Natterer returned to Austria with more than 50,000 well preserved specimens, many totally new to science. Natterer was also the first European to hold a discus fish in his hands. The Heckel, named after a scientist who worked on Natterer’s collection, is the most unique discus fish. The other species are not as difficult to breed; even wild discus fish will breed in water conditions far removed from those in the wild. The Heckel, however, requires acidic and soft water. In the wild, the pH of the water it is found in can be as low as 3.2 and never above 5.0. The Heckel will thrive in an aquarium with a higher pH but a pair simply will not breed. Indeed, the few that have achieved success have done so by replicating water conditions similar to the wild. Hybrids with other discus fish species have been produced, but invariably involve a male Heckel who is literally forced to spawn by a female discus fish of another species. The lack of demand for the Heckel — aquarists want spectacularly colored strains and not wild fish — has contributed to the Heckel not being domesticated, which would have resulted in easier to breed fish generation after generation. The common angelfish was at one time as difficult to breed as the Heckel, but persistence and demand resulted in continued breeding. Today tank-raised angelfish are so easily spawned that even a novice can achieve success. Tank-raised angelfish are not demanding in terms of fish food, water conditions or even water temperature. We see a very changed situation when we compare domesticated angelfish to their wild counterparts, which like Heckel discus, are bred by pairing a wild male with a tank-raised female, who also forces the male to spawn. This difficulty in breeding the Heckel and lack of interest from a commercial perspective is unfortunate, for the Heckel has the most perfect round body of all the discus fish, the desired shape in a discus. Their striations are near horizontal, which adds to their beauty. The dark first, fifth and ninth vertical bars are considered by some unattractive. It is also more regal in its movements. It is beautiful in its own right. 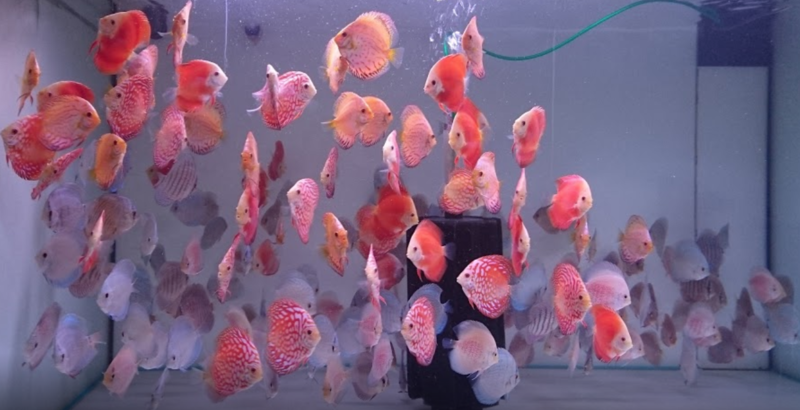 Perhaps one day, when interest in discus fish focuses again on wild fish, as it has in the past, someone will look at breeding the Heckel commercially. Until then, discus keepers will have access to wild Heckels that each year are exported by the hundreds from Manaus in Brazil. Shortly after the discovery of discus fish in Brazil, the presence of discus fish in Asia started to become popular. Fish keeps in Asia then attempted to breed the different strains of discus imported from Brazil to create the different strains strains of discus available today. As of today, Brazil is the primary source of wild caught discus. Asia is the primary source of domestically bred discus. Many domestic discus are also bred in the USA but not as much compared to Asia. Asia has many world known discus breeders more than the USA.